A remodel isn’t always about just wanting new cabinets. More often than not, a remodeling project starts because the shape of the space isn’t working for you any longer. And while it may seem easy to bust down a few walls and change the placement of a few key pieces, planning the layout of your kitchen or bathroom takes a bit of work. The layout of your kitchen or bath can change the way you look at the space, and if not done to your expectations, leave you feeling unhappy with your remodel. The Actual Space: Check out how the space works now and what benefits it has. You’ll want to know how much natural light comes in and what types of pipes and electrical fixtures need to be changed. Understand how the space works in the home now so you can make sure it incorporates itself effortlessly after the remodel. Zones: What areas do you have in your kitchen that you use to cook, prep food, store cookware and dishware etc. Do you need a better layout to accommodate other areas in your kitchen? The zones you create will make the space easier to work in. Work Triangle: The area that is created by the placement of the refrigerator, sink and cooktop. The distance between these three pieces will greatly affect the way you work in your kitchen. 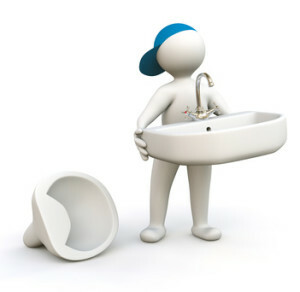 Personal Space: No matter if it is a master bathroom or a family bathroom, you need to create personal space within it. In a master bath, two separate areas make it easier for two people to get ready at the same time. Since the family bath will often have multiple people brushing teeth or washing hands, having two sink basins next to each other helps. Tub/Shower/Toilet Placement: Items that are harder to move around in a remodel, the tub shower and toilet are usually the items that are placed poorly. Take time to make all of your bathroom ideas work together. Your home should flow effortlessly, and one poorly laid out room can mess that up. Take time to work with a designer to get things right.